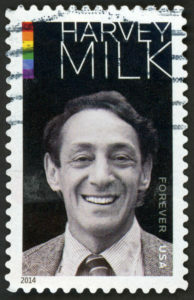 Gay rights activist Harvey Milk served as a lieutenant in the U.S. Navy. Right on the heels of the announcement of the first LGBT National Monument comes another honor for the movement. On July 14, 2016, the U.S. Navy announced that a ship is to be named after gay rights icon, San Francisco City Supervisor and Korean War Navy veteran, Harvey Milk. Milk served as a diving officer during the Korean War for four years, first aboard the submarine USS Kittiwake, then in San Diego as an instructor. He reached the rank of Lieutenant, junior grade before his honorable discharge in 1955. He could not be out at the time—official policy for ‘Dealing with Homosexuals’ in the Armed Forces at the time was an undesirable discharge for the inclination alone, and a dishonorable discharge if the inclination was believed to be acted upon. “Don’t Ask, Don’t Tell” was still almost forty years away, and a full lifting of the ban didn’t happen until 2011. Milk, whose importance to the LGBT community truly began when he entered the California political scene as an out gay man in his forties, didn’t live to see it. He did see the passing of a powerful gay rights bill in San Francisco after he was elected to public office there, but he was assassinated in that office by political rival Dan White. The ship, which will begin construction in 2018, is the second of the Navy’s new class of fleet oiler ships. The class is for logistical support, meant to refuel and restock other vessels while underway. Named the John Lewis-class after Georgian civil rights activist Rep. John Lewis, every vessel of the type will be named after civil rights leaders. Other vessels in the class will be named after SCOTUS Chief Justice Earl Warren, women’s rights activist Lucy Stone, and abolitionist Sojourner Truth.